Features two different tour opportunities. The first tour is a full day (6 1/2 hours) historical wilderness tour. First ride the Toonerville Trolley, an authentic narrow gauge train which takes passengers 5 1/2 miles through thick forest, the home of many types of wildlife and birds. Once the train arrives at the river, passengers board a spacious riverboat for a 21 mile a narrated river cruise. The boat docks at the head of the rapids, above the falls, for 1 hour and 15 minutes. Passengers may then enjoy a nature hike (5/8 of a mile each way) to our private viewing area at the Upper Tahquamenon Falls. Once passengers return, the riverboat cruises back up stream to the waiting train, which returns everyone to Soo Junction. Departs 10:30am returns at 5pm. Food, beverages, and restrooms are available on board. Tour #2 is a 1 3/4 hour Wilderness Train Ride. Travel on the country's longest 24 inch narrow gauge railroad, 5 1/2 miles to the end of the train line, where a 20 minute stopover is made for switching. 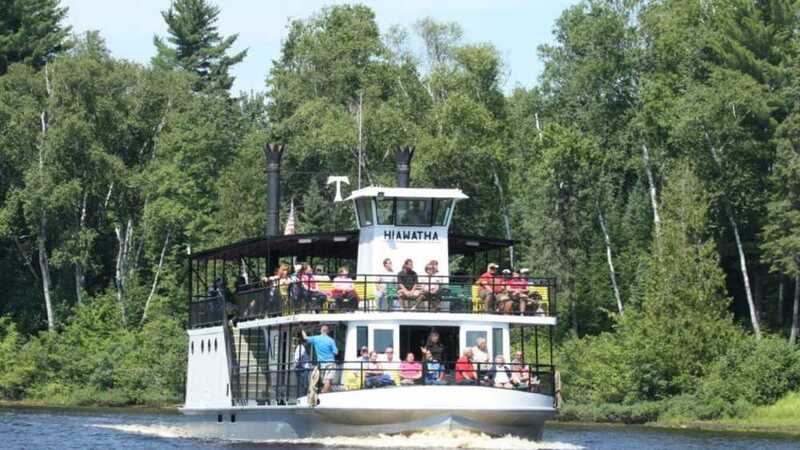 Enjoy a scenic view of the Tahquamenon River. A snack bar and restrooms available, then return to Soo Junction. Along the way use our provided tree guide to learn about area timber types. Tour #2 departs at 12:30pm. Tour #1 is the only tour to the falls. A Must Do for bird watchers and nature enthusiasts. Celebrating our 88th year in business. Family owned and operated since 1927. Open mid June through early October.